C-Line has your solution to document storage for your A4 size papers. 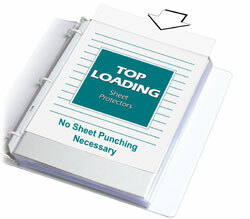 A4 size sheet protector fits international A4 size binders. Holds 11.75 x 8.25 inserts. All the benefits of polypropylene - photocopies won't stick and acid-free. No sheet punching necessary. Standard weight. Clear finish. 11-Hole punched. Sheet Protector Special Features: Clear standard weight polypropylene top loading ring binder sheet protector fits A4 (11 3/4 x 8 1/4) inserts. Suggested Use: Oversized, durable storage for A4 sized documents and reference materials.